When you cook and adapt and create recipes every day it’s easy to get swept up in the many variations and tricks that are certainly fun but not always necessary. And a few of the teaching projects I’m currently working on are forcing me to strip things down to the very simplest preparations, to really practice what I preach– that cooking can be liberating, a way to frankly make life less complicated rather than more; that cooking can be simple, creative and just plain fun, not to mention delicious, economical and convivial. It still feels like fall has just begun since the weather here in Oregon is warm and glorious, however, the produce at the markets clearly marks the passing of summer and early fall. The peppers are gone and cabbage is here and so is winter squash in its many sizes, shapes, and flavors. And this year’s crop of dry beans is arriving and my quince tree is loaded. 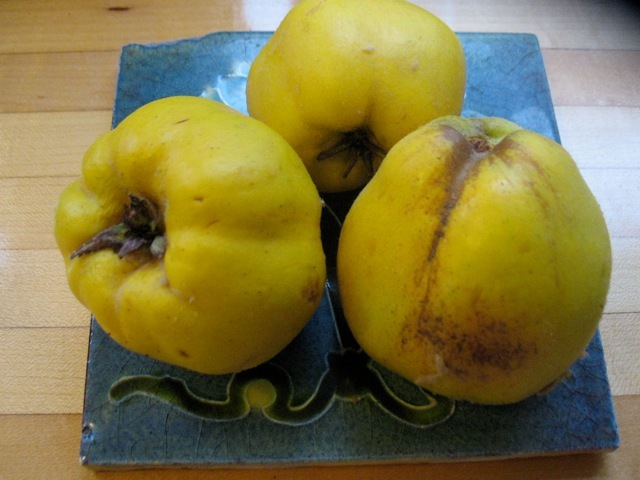 This week I was feeling overwhelmed by the fairly labor intensive ways to preserve quince (my dwarf tree produced 50 quince this fall!) 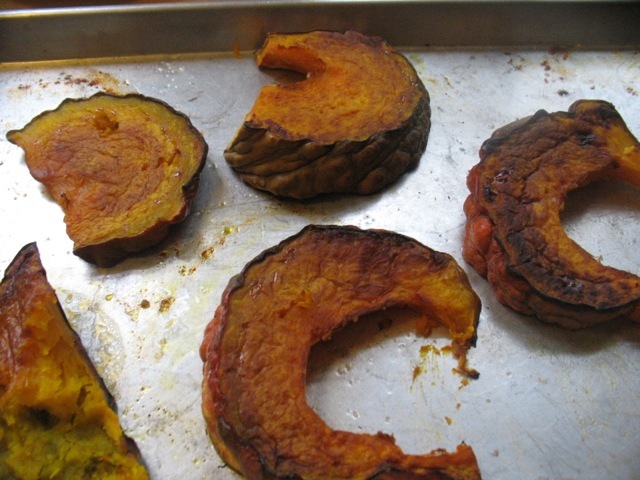 so I decided to simply bake the whole unpeeled fruits in a covered pot, as I was already roasting beets. 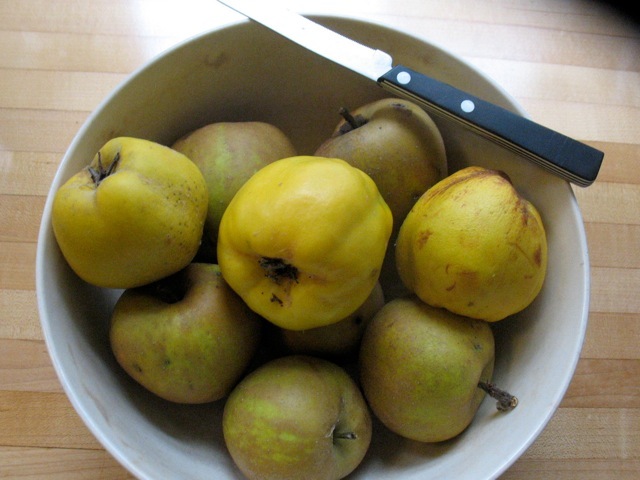 And voila, after an hour the quince had become sauce and I just needed to pick out the cores and stir in some honey. 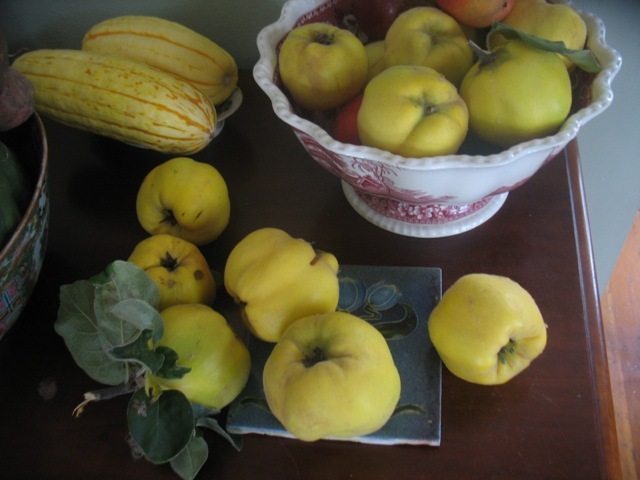 The beauty of this season’s produce is intoxicating and I’m reminded that even this time of year, the hard, grainy quince and the unwieldy, weighty winter squash can be prepared and enjoyed with ease. And in the case of the latter it can be sliced and baked and enjoyed with nothing more than salt and maybe a little olive oil or maybe some salsa verde. And then there are beans! The humble, wonderful and under appreciated dry bean I love so much. 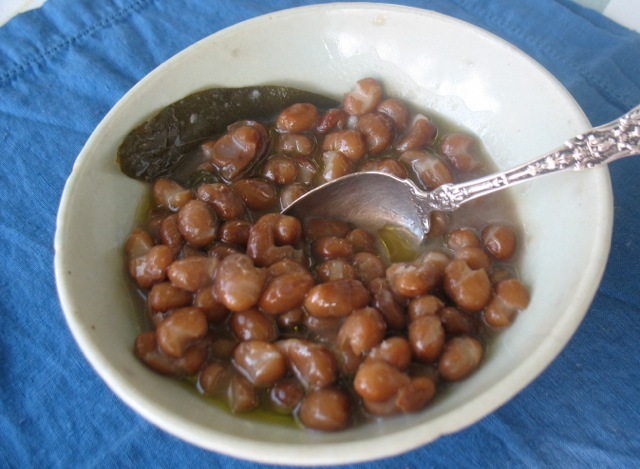 I just ordered 30 lbs of pinto beans from one farm and will be loading up on other varieties from another soon. Nothing makes me feel more secure than big jars of beans in my pantry. Soaked and then cooked with a bay leaf a clove of garlic and chunk of onion and then left to cool in their broth, . . .then a sprinkle of salt and drizzle of oil and lunch is served. And put the three together–wedge of squash, bowl of beans and quince sauce for dessert-simple indeed! Are you wondering how to make your autumn cuisine delightful, delicious, and inspired? Join Ellen Goldsmith and Katherine Deumling for an evening of conversation and eating just for autumn. 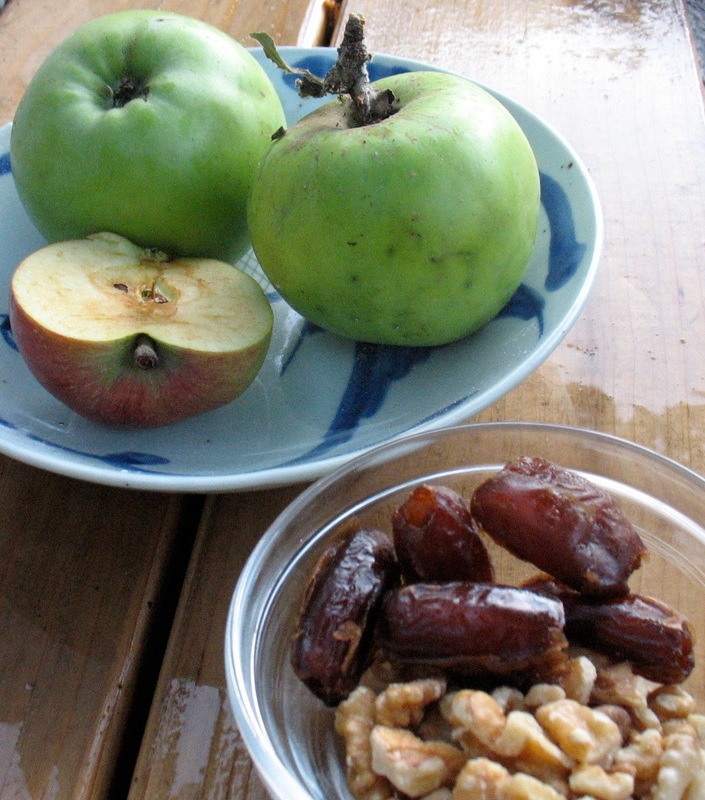 What does this season’s food tell us about our bodies, our vitality, and our appetites? Katherine will bring her cook-with-what-you-have approach to delicious, produce-driven dishes for this abundant but cooler time of year. Ellen will offer an overview of the Chinese medicinal and seasonal culinary philosophy as it applies to the autumn season to enliven your cooking. 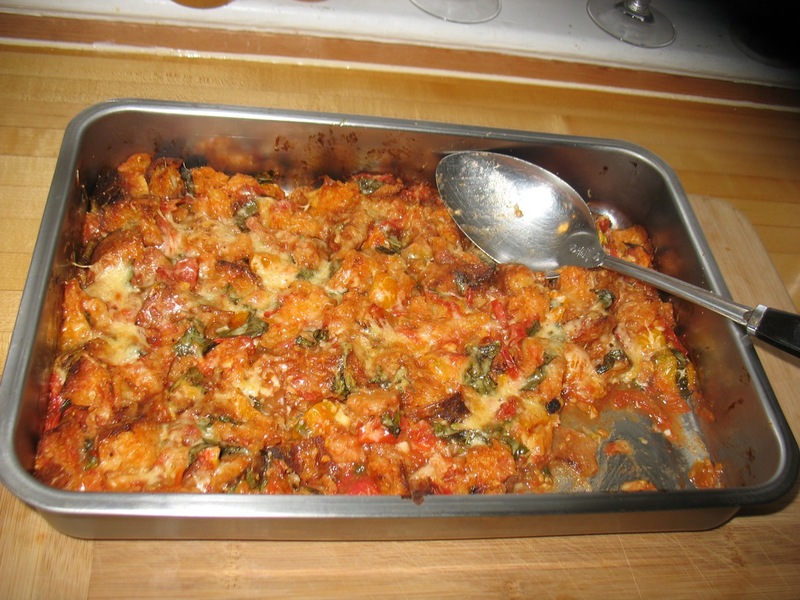 • How tastes of different foods energize your cooking and you! You will receive materials, including the evening’s recipes. Ellen Goldsmith, licensed acupuncturist, brings a passion for cooking and food with over 25 years of experience practicing Asian medicine and teaching all about the vitality and potency of food through the lens of Chinese medicinal principles. She practices acupuncture, dietary therapy, Chinese herbs, body-mind health, and Mindfulness Based Stress Reduction at Pearl Natural Health in Portland. In addition, she shares her passion for transforming our lives through our health on her weekly podcast Health Currents Radio and as a board member at the National College of Natural Medicine, the oldest naturopathic medical school in the country. 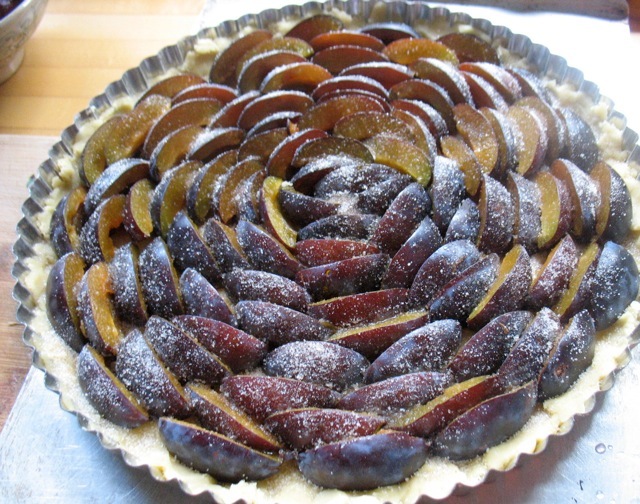 Italian Prunes make this simple tart so delicious and there is a short season for these so take advantage if you can find some. There are many versions of this Bavarian dessert and many of them use a yeasted cake as the base. 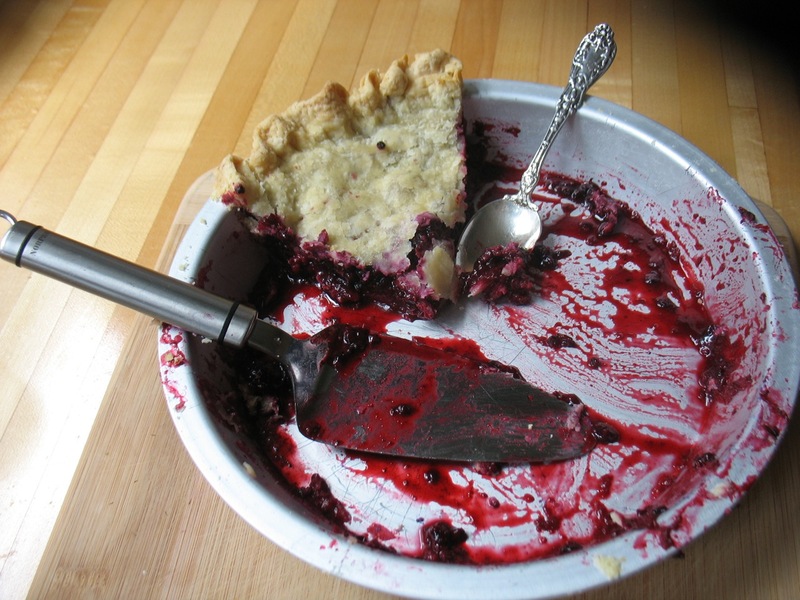 I grew up with a butter heavy, short crust version and am thus devoted to it. You want Italian Prunes since they have the acidity and complexity that makes this simplest of all desserts so incredibly good. 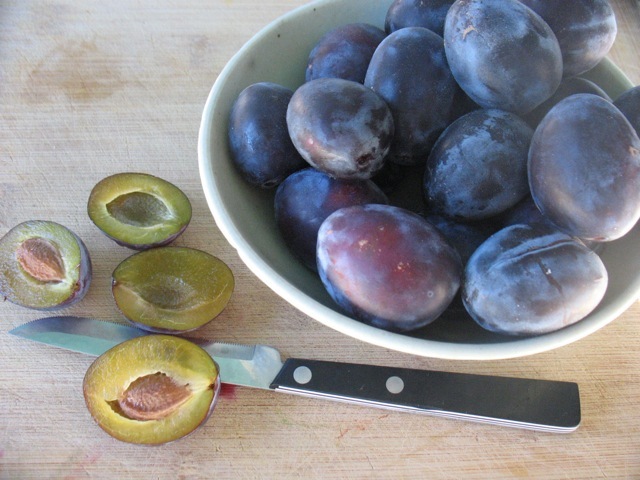 Italian Prunes are sometimes called Prune Plums or just Italian Plums. I know over the years growers and marketers alike began avoiding the word prune and conflating it with a dried prune but I cling to what I think of as the real name! My home state of Oregon used to be a very large producer of this wonderful fruit, delicious both fresh and dried. Many of the orchards have been taken out over the years, often to make room for vineyards which admittedly produce a sexier crop. These prunes are the epitome of late summer to me and my mother brought me a big bag of them and I couldn’t resist pulling out her recipe and making this childhood favorite. And while there are many variations of this cake, they are ALL (in Germany at least) served with lightly sweetened whipped cream so please don’t skip that, unless you’re having it for breakfast, and even so it wouldn’t be a bad idea. When cooked, the prunes take on a lovely pink hue and the dusting of cinnamon and sugar just barely caramelizes the fruit. Cream the butter with the sugar until just mixed. I know it seems silly to try to split one egg in half but it’s possible so do that or just use the yolk of a large egg. Or if you happen to have a very small egg use the whole thing. It doesn’t really matter so much how you do this. You can always add a bit more flour if the dough is too sticky. 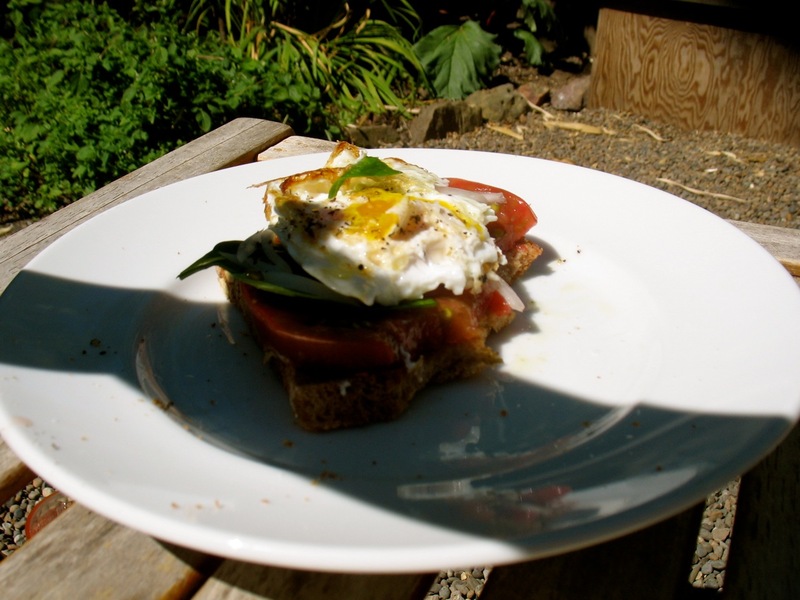 The original recipe is double the above quantities with one whole large egg. It makes a lot of dough which is why I halved it since it fits perfectly into a 10-inch tart pan. 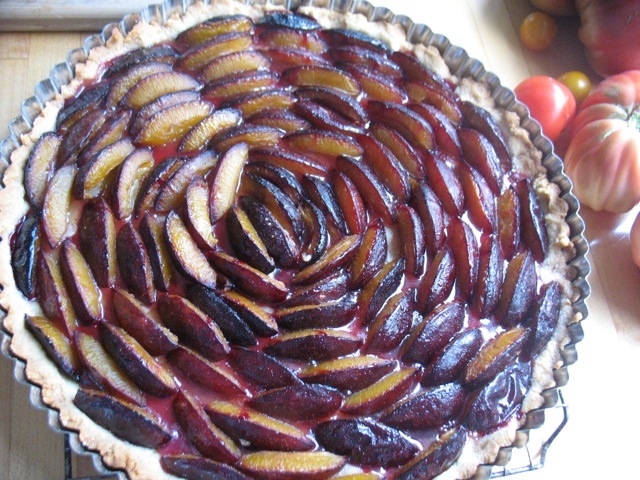 Feel free to double it and make a larger version of the tart or save half the dough for something else. When the egg has been incorporated mix in the flour and salt. Use either a wooden spoon or your hands. Work the dough until it’s nice and cohesive. It may be a bit sticky so just add a bit of flour. Pat the dough evenly into a 10-inch tart pan with the palm of your hand. You want to bring the dough up the sides just by 1/3 -inch or so. If you don’t have such a pan you can also press it into an 8″ x 13″ pan. If you are using a 10-inch tart pan you may have a little excess dough with which to make a little mini tart as happened to me on my second batch recently. Now cut the prunes into quarters and arrange them tightly in circles, starting from the outside and moving inward. If you’re using a rectangular pan arrange them in rows instead. The fruit will shrink so pack them in well, pressing down just a little. When you’ve covered the dough mix the cinnamon and sugar together and sprinkle evenly over the fruit. 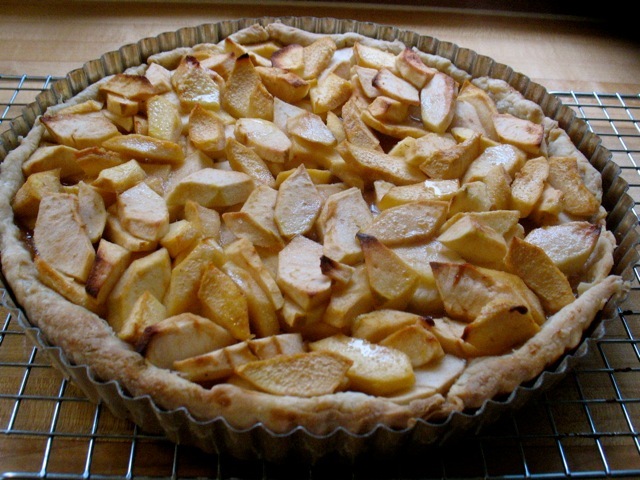 Bake in the lower half of the oven for about 35 – 45 minutes until the fruit has released some juice and is bubbling a bit and the edge of the crust is golden brown. Let cool to room temperature and enjoy with lots of whipped cream. 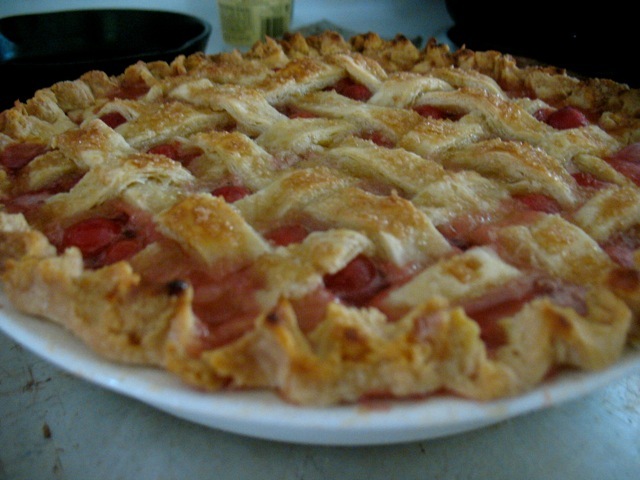 I like this tart both on the first day and on the second, when the crust softens a bit and absorbs the juice. Enjoy these heartbreakingly beautiful days with so much bounty to cook and preserve and eat! 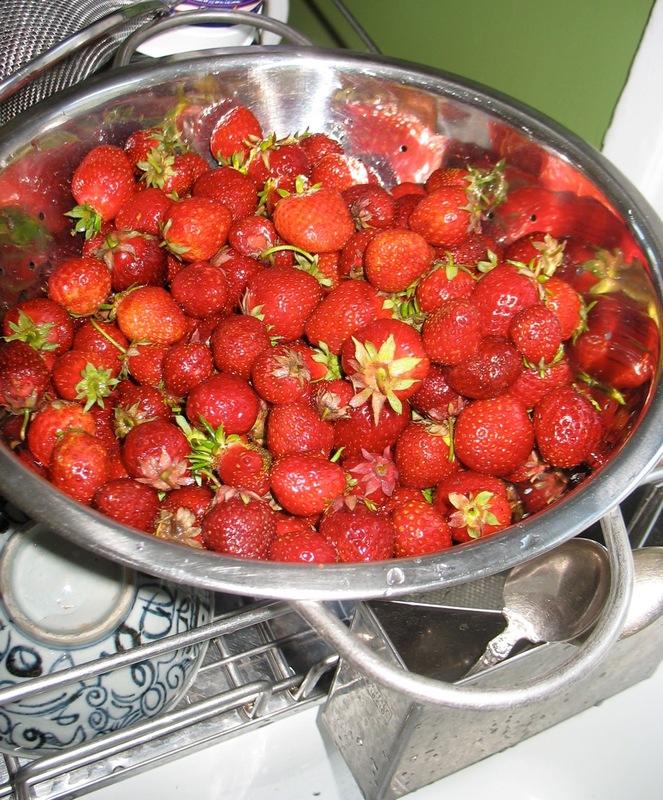 Strawberries: ready to be transformed into popsicles, ice cream, jam and a roasted compote. It’s been a tough season for strawberries here in the Northwest. The cold and rainy spring has delayed the season and the berries tend to be smaller and less sweet than usual. However, they still are a treat, a long-awaited treat. They are my husband’s favorite berry and they’re really quite versatile. Once you’ve had your fill of them plain, right out of the green cardboard pint basket there are so many options. And if you’re like me and u-pick them or buy them by the flat you’ll quickly realize there really are only so many berries one can eat in the moment before they spoil. So, this is what my kitchen counter looked like last week after my first real haul of the season. And I’m going back for more later this week since I don’t yet have my quota for plain, frozen berries, jam, etc. Sliced strawberries waiting to be turned into jam, strawberry yogurt popsicles, roasted strawberries and strawberry ice cream. 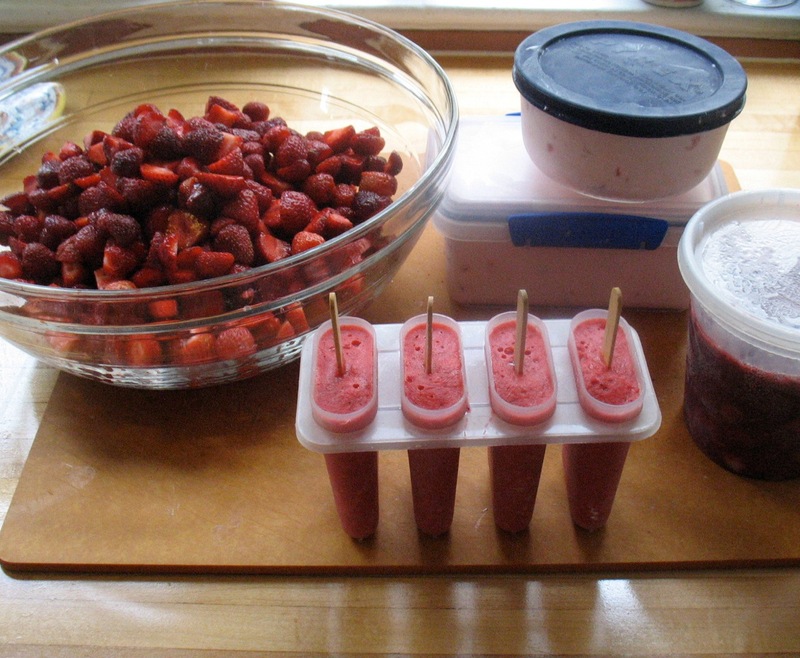 I make popsicles all summer and usually add a bit of yogurt and honey to any fruit that’s suitable for popsicles (berries, peaches, etc.). The strawberries I picked last week were not very sweet or particularly flavorful so I decided to roast a bunch of them which is what is in the container on the far right of the photo above. Roasting brings out the sweetness in most any fruit or vegetable and strawberries are well-suited to this technique. I spread about 2-3 pints worth out on a sheet pan (cut in half), drizzle them with about one tablespoon of balsamic vinegar and about 1/2 cup of sugar (more if you like them sweeter or the berries are particularly tart), toss well and roast at 375 until they are greatly reduced and the juice becomes syrupy. This can take anywhere from 40 – 70 minutes. They are wonderful over ice cream, stirred into yogurt, mixed with other, fresh fruit in a crisp or cobbler, etc. . . .they are quite intense in this preparation so can go along way. 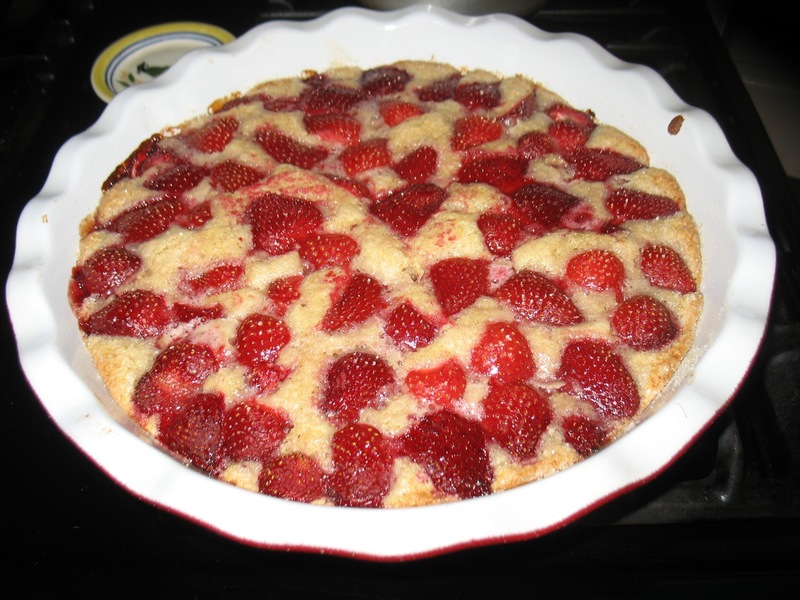 Baking with strawberries is a bit trickier than other berries. They don’t hold up so well and tend to lose their punch. As you might recall from my wedding cake adventures last summer, creating a concentrated, stable strawberry filling was quite the task. So I was delighted to find this simple strawberry cake recipe on smittenkitchen this spring and have been enjoying it immensely. It’s quick, beautiful and delicious. I have adapted it only in two small ways. I reduce the amount of sugar in the batter to 3/4 cup and I add 1/4 teaspoon of ground cardamom and 1/8 teaspoon finely ground black pepper to the batter–Makes for a slightly more mysterious cake. 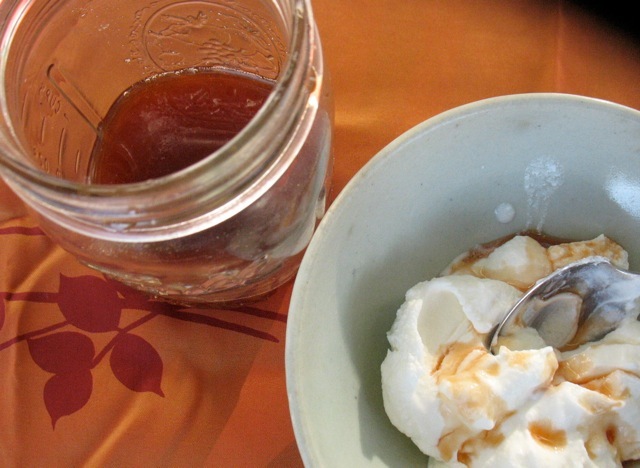 And if you’re feeling really adventurous add a little Kirsch to your whipped cream. 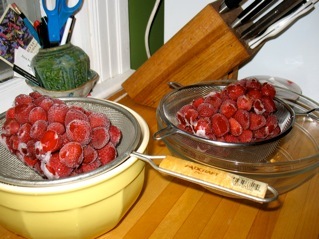 And if you really find yourself in a time crunch and need to process berries just freeze them whole in containers or bags. In mid-winter those berries are perfect in a bowl of steaming steel cut oats. 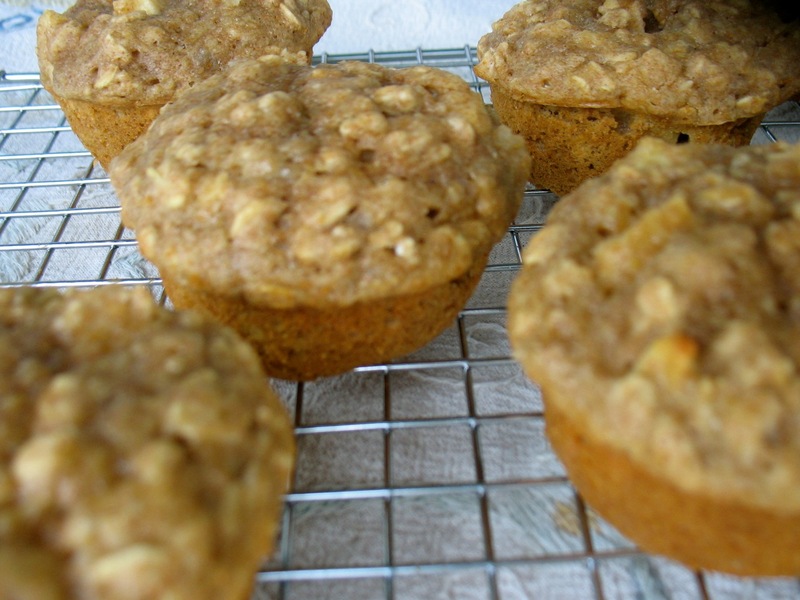 Apple Oat Muffins . . . not the most photogenic muffins in the world but satisfying nevertheless. I have a private client at the moment who has three sons; 11, 14 and 16. I grew up with three brothers so I know how much they can eat, but for years now I’ve lived in a household of two and more recently three and I’m just not accustomed to those quantities anymore. This client wants ideas and recipes for hearty, healthy snacks for the boys. So I’ve been testing and making a variety of things including lots of muffins. 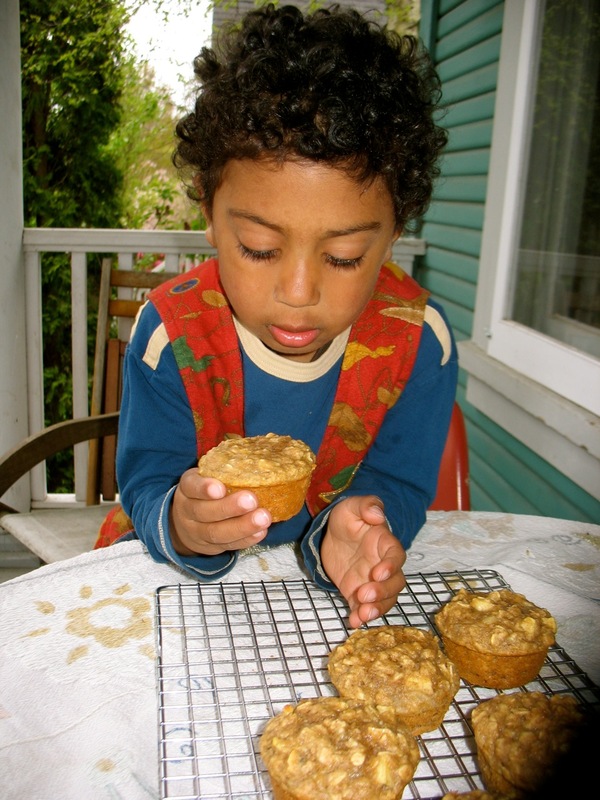 Muffins are in many ways ideal: they are baked in individual portions; they freeze well; they are portable; and they are adaptable to many different tastes/styles/ingredients. I have a feeling my client’s boys could eat a whole batch of these in one sitting but for those with smaller families, freezing part of the batch is a great idea. I have always loved to bake and made more than my fair share of layer cakes out of the Joy of Cooking as a teenager. My tastes have changed over the years and I like things a bit less sweet now but until a few years ago, I carefully followed dessert recipes. Not anymore. The cook-with-what-you-have mindset has wormed its way into my baking (and other desserts) as well and I substitute and tinker to my heart’s content. There are still some recipes I strictly follow and certain chefs whose recipes I know better than to change because they are always perfect (David Lebovitz among others). . . .However, muffins are the perfect foil for tinkering and I want to convey that freedom to adapt baked goods like this to my client(s) so that good, home-made snacks like the below muffins become part of people’s regular routines. I’ve been playing with these Apple Oat Muffins this week and they are a perfect example of a quick-to-make snack (dessert, breakfast, picnic treat) using items you might already have in your pantry or you can substitute with ingredients you do have on hand. 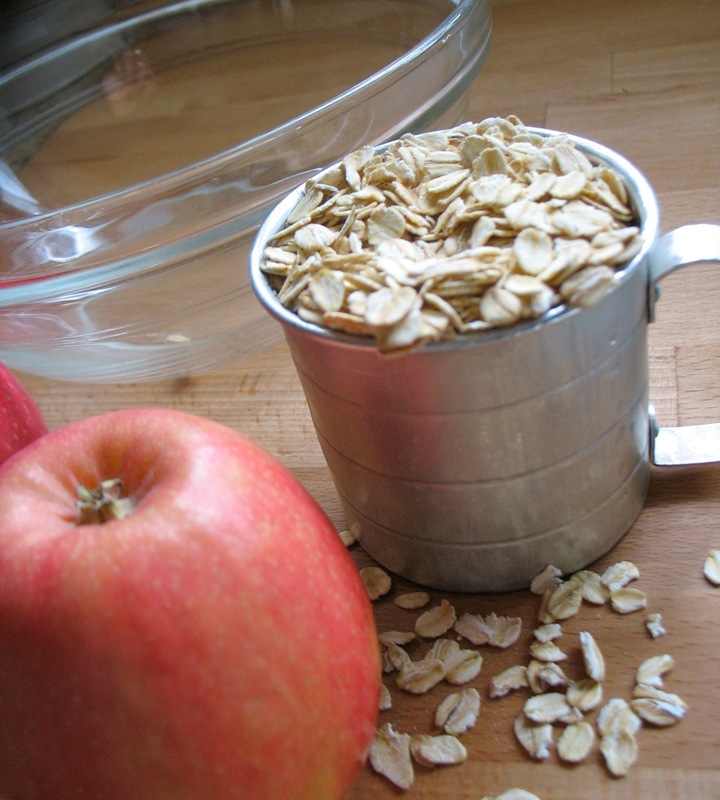 They are just barely sweet but the combination of the fruit, the texture of the oats and the spices works well. These muffins call for as much oats (by volume) as flour. Muffin (and waffle, pancake, biscuit. etc.) recipes often call for buttermilk. I hardly ever have buttermilk on hand so I substitute either whole milk with 1 tsp of lemon juice per cup of milk or yogurt or a combination. Both work really well. I use whole milk in all my baking/cooking and think it gives the best results but 2% is workable too. These muffins would also be delicious with the addition of raisins, chopped walnuts or almonds, shredded coconut, other dried fruit or fresh blueberries or raspberries. You could substitute mashed bananas for the apple sauce though you might reduce the sweetener a bit since bananas are sweeter than apples. 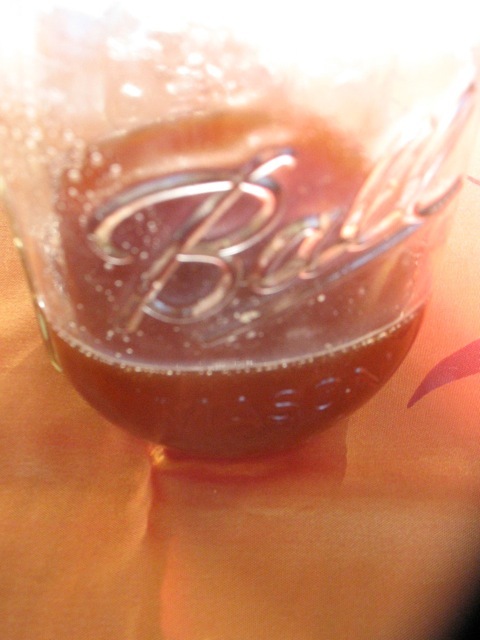 And speaking of sweeteners, you could substitute maple syrup for the honey or use brown sugar or granulated sugar though honey is a bit sweeter than sugar so reduce the sugar amount by 1/4 or so. You could also play with different kinds of flour or combinations of flour. You might use half spelt flour and half all-purpose, etc. Kim Boyce’s wonderful book Good to the Grain is a wonderful resource on whole grain flours of all kinds. 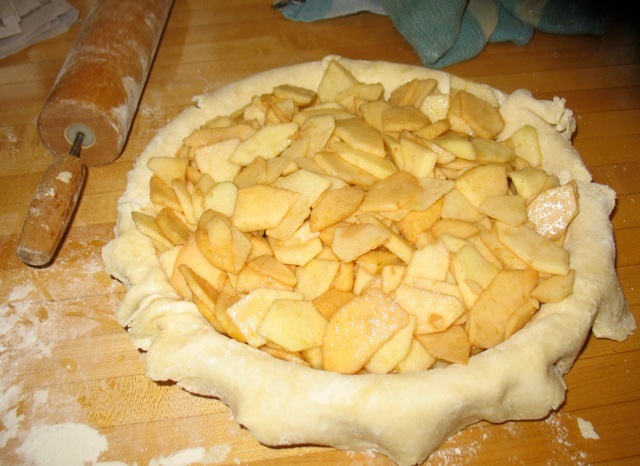 When tinkering with baked goods you do want to keep the proportion of dry and wet ingredients the same. There are a few other rules (which I will explore in Bake With What You Have – Part II) but muffins are pretty forgiving so go ahead and play around and see what you like. These muffins are not very sweet. 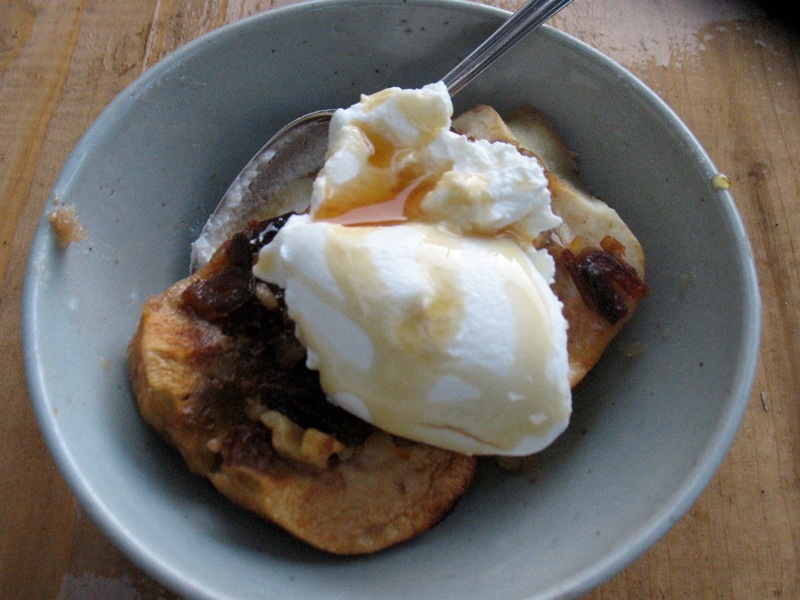 If you like things a bit sweeter by all means add a few more tablespoons of honey. Lightly oil or butter a 12 cup muffin tin. In a large bowl combine flour, oats, baking powder, baking soda, salt and cinnamon. 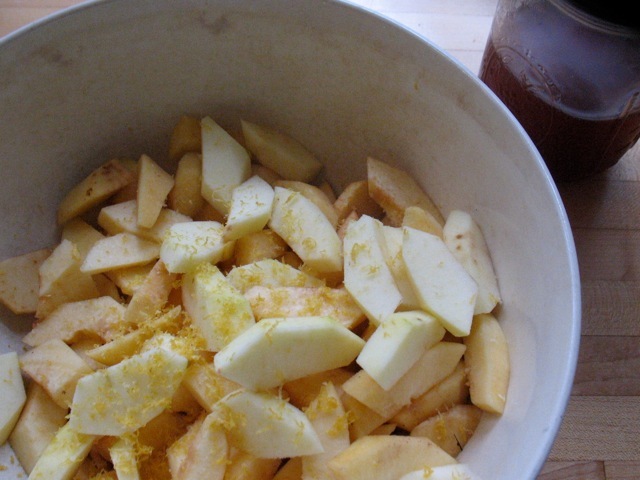 In another bowl combine applesauce, milk (or yogurt), honey, oil, egg and lemon zest, if using. Combine wet and dry ingredients and stir quickly until just combined. 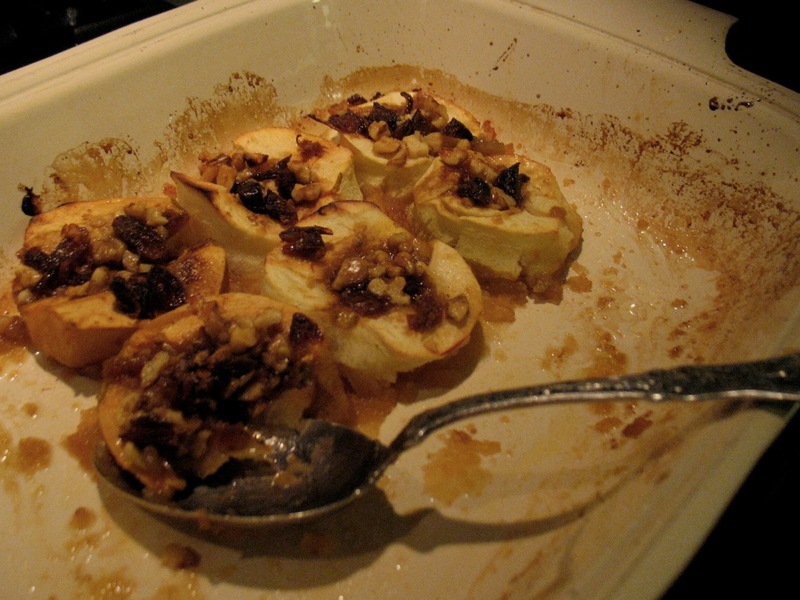 Add the chopped apple and fill muffin cups. 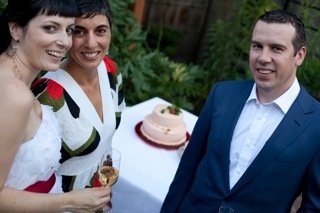 More than three months after the wedding for which I made the above cake, I am finally going to share some photos and stories. Now, as I gear up for my brother’s wedding it’s fun to reflect back on the last wedding in which I played a small culinary part. I had never before made a wedding cake. And I didn’t hesitate for long when Margo asked if I would make hers. She’s a very good friend, the wedding was not going to be huge and I had plenty of time to test, learn, fail, test again. . . .The wedding, however, was going to be populated by foodie/wine types with sophisticated palates so the pressure was on. In hindsight, the pressure was all entirely and needlessly self-induced and Margo never contributed to it whatsoever. The guidance she gave me was that the cake be centered around strawberries since the wedding was going to be in late June in Oregon. Fair enough! I’ve made strawberry rhubarb pie; roasted strawberry and balsamic tart; strawberry ice cream; strawberry shortcake; and strawberry jam, but I did not realize at the outset of this project how challenging it is to get a true, strong strawberry flavor into a layered cake. Luckily the Cake Bible came to my rescue on this matter. 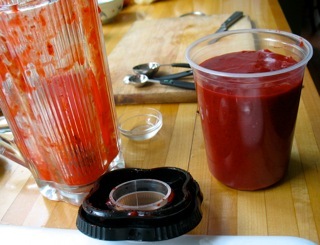 The best way to accomplish this strong, fresh strawberry flavor is to pick the best berries you can find–not an easy task during this cold, water-logged spring–freeze them whole, then thaw them (this helps break down the membrane), then strain them, then reduce that juice significantly and finally mix with the blended pulp, a little lemon juice and touch of sugar. And voila! you have a super concentrated puree. I substituted this puree for the lemon juice in a classic lemon curd recipe to make the cake filling. It was delicious! I had tried both stabilizing the plain puree with gelatin and mixing it with whipped cream but neither of those fillings held up well enough with the size and weight of the cake layers and would not have cut or transported well. My next challenge was cake flour. I tested cake after cake made with cake flour–the hyper-processed, bleached , soft white flour that gives typical wedding cakes and other special occasion cakes that signature fine crumb. However signature it is, it often reminds me of grocery store sheet cakes. My test cakes tasted sort-of fake and like the smell of the plastic trays they come on. Then came the color. I wanted a really pale, almost white cake to create a nice contrast to the strawberry curd filling and buttercream and, however, tasty some of the cakes I tested were, they were too yellow. After testing half-a-dozen base cakes, I landed back on the first one, Grand Central Bakery’s Vanilla Velvet Cake. It uses just egg whites and all-purpose flour and holds up very well, both in structure and flavor. 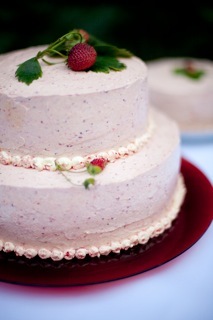 My dear pastry-chef-friend Ellen not only lent me her cake pans and ideas (the strawberry curd was her idea) but her sophisticated palate and showed up with her husband–an excellent eater and critic in his own right–on a regular basis for taste tests. The buttercream was actually the least complicated part of the cake. The Cake Bible once again had the answer in Neoclassic Buttercream that I also flavored with the strawberry puree and just a touch of Kirsch. 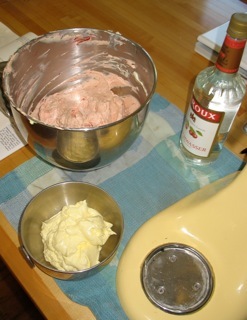 The puree lent the buttercream a wonderfully marbled, reddish-pink hue and the Kirsch cut the richness just a bit. 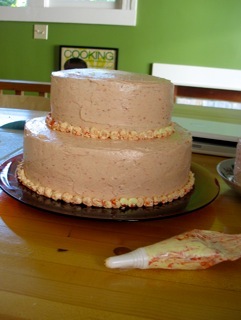 I’d make another wedding cake just to have an excuse to test and eat that much buttercream. The trickiest part of the whole wedding cake project I think typically is baking perfectly flat cake layers. The instant give-away of the cake made by the novice is the sloping, slanted look noticeable even with the slightest asymmetry. The Cake Bible has elaborate tables with equations for avoiding such slanting affairs. It all has to do with the leavening and how to decrease it in proportion to the other ingredients as the cake layers get bigger. I was careful and followed her instructions–by far the most complicated math I’ve found myself doing in my adult life. I weighed the batter for each pan precisely and ended up with very even layers. I also had done lots of research on the assembly and how best to support the layers: dowels, drinking straws, etc. I had purchased my cardboard cake circles at the Decorette Shop as well as an off-set spatula (the most important tool of all) where I had seen all sorts of crazy things I didn’t know existed including shelf-stable strawberry cake filling in a plastic bag. 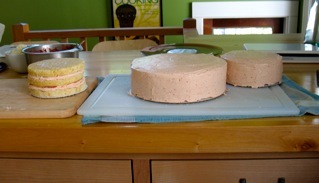 I did not ditch my strawberry curd plans for said, bright red filling. . . .And I happened to have a beautiful red glass cake plate from my grandmother that just fit the cake so I was able to avoid the foil-wrapped board. I filled, frosted and assembled the cake the day before the wedding in a house all to myself. Ellis was at my mother’s and Brian was off watching a World Cup Soccer game and I cranked up the music (Bruce Springsteen I think) and went to work. All the research and prep paid off. Everything worked and at the last-minute I remembered a trick I had seen on one of my favorite baking blogs to create a marbled effect with the buttercream. I left a bit of buttercream plain and gently mixed in some of the strawberry puree in the pastry bag and used that to pipe on my borders. Finally I decided against the flowers the wedding florist had set aside for the cake and went to my back yard and picked real strawberries with their stems and leaves and used those for the final touch. To make a now very long story a bit shorter, the trip to the location of the wedding (actually two trips since the restaurant sent us back home with the cake as they supposedly didn’t have anywhere to keep it for the few hours until the wedding!) was by far the most stressful part. 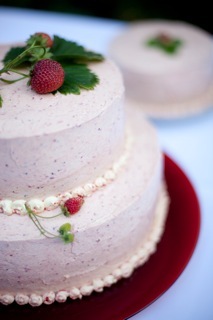 But the buttercream held up despite the warm weather, the bride and groom loved it and we had plenty to go around. And yes, I would make another wedding cake but again only for someone I know and love. I will not be going into the wedding cake business. The Cook With What You Have philosophy is a bit at odds with all those structural and visual needs of a wedding cake!